Toronto ON — The anticipation is mounting at Miss Teen Canada- World (MTC-W) (www.missteenagecanada.com) as the lead up to the finals next week on July 17th, 2010 at the Toronto Metro Convention Center approaches. MTC-W has secured this year’s panellist of judges to contribute to the search of this year Teen Queen Hero. Provincial competitions have been conducted from coast-to-coast over the last few months offering thousands of girls aged 13-19 the opportunity to compete for the coveted title and the largest prize package awarded in a Canadian Teen Competition. The MTC-W Competition is the only national search that conducts provincial competitions across the country to select over 70 finalists for 2010. It also offers over $25,000 in cash, prizes and scholarships will be awarded to talented aspiring teens. Toronto’s forefront of personal model management, Elmer Olsen will join Lorraine Zander founder of Faze Magazine, Canada’s Design Darling Farley Chatto and Christopher Healy acting teacher and public speaking coach will sit on the judging panel for the upcoming finals of Miss Teen Canada- World. There influential backgrounds will help to discover this year’s reigning Miss Teen Queen. Partnering with Free the Children – in 2009 MTC-W raised well over $49,000 for this Toronto based charity – which empowers children in North America to take action to improve the lives of fellow children overseas. Each girl is required to raise $400 as a prerequisite into the National MTC-W Contest, and the winner will have the opportunity to travel to Kenya and have first-hand interaction visiting the projects. 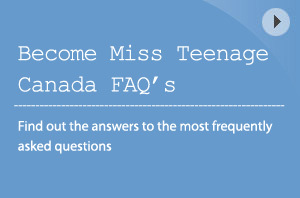 About Miss Teenage Canada: (www.missteenagecanada.com) MTC-W Competition is the only national search that conducts provincial competitions across the country to select over 70 finalists for 2010. The staged show produced in each Online Casino province is to showcase the girls’ talents and the overall winner becomes “Miss Teen” of their home province. The remaining finalists are awarded city titles and invited to travel to Toronto with nine other provincial winners to compete for the title of Miss Teenage Canada. This is the only competition that has the rights to send the winner to the International Miss Teen World Competition. Organizers have searched the country for the best of the best. 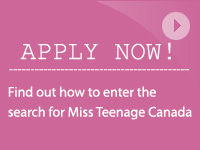 These Canadian teenage finalists are those who will compete for the title of Miss Teenage Canada to represent Canada. Miss Teenage Canada 2010 will go on to represent the country and compete in Houston, Texas, for the coveted Miss Teen-World title in August. This final Canadian competition will be held in downtown Toronto on Saturday, July 17, 2010, at 8:00 p.m. at The Metro Toronto Convention Centre. Miss Teen Canada-World provides the finalist with the opportunity to be an ambassador for Canada with the mandate to empower youth to take a leadership role in their communities and to create world-changing actions through Free the Children- last year MTC-W raised over $49,000 for Free the Children. The girls will also be judged on academic achievement, presentation and self-confidence and community contributions. All of these qualities will enable a young woman to become a leader of tomorrow. About Free the Children: (www.freethechildren.com)Free the Children’s domestic program provide North American youth with the confidence and leadership skills they need to take action on social issues in their communities and overseas. Their motto for these programs are “educate, engage and empower,” a three step process that helps young people develop into socially-conscious global citizens.